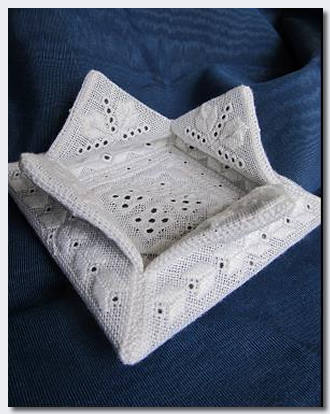 The Angel Wings Lotus Box is a Whitework design finished into a lotus Box shape. The Lotus Box designs developed one night when I was watching my daughter fold Origami pieces. 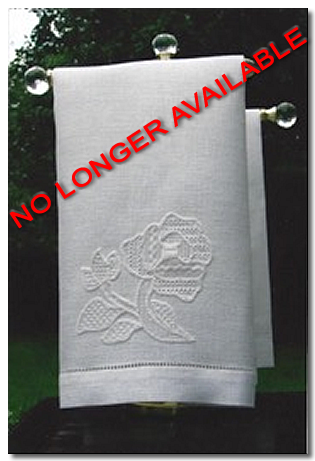 The design is worked using spot eyelets, satin stitch, chain eyelets, single eyelets, backstitch, and Smyrna crosses. The finishing is very easy using only back stitch and whip stitch. The design is fully stitched twice to create a front and back. Kit Contents: 28 count white Cashel linen, pearl cotton size 8 & 12, tapestry needles, instructions. Finishing supplies not included. Sweet living in the summer time! Imagine a warm summer morning, with juicy blackberries glistening in the sun. Bees buzz on their search for nectar while a caterpillar lazily crawls along a stem. 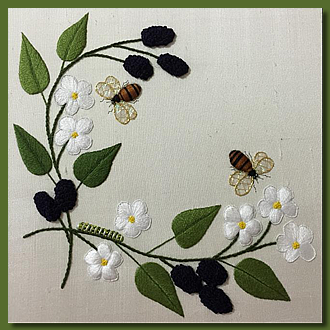 This Stumpwork class brings this vision to life as students learn and practice a variety of dimensional stitches and padding techniques. Design Area: 5" x 6"
8-1/2" embroidery hoop; cream colored sewing thread; masking tape; needle threader; scissors for cutting paper and felt; usual stitching supplies. Magnification is highly recommended. The Travel Bead Purse includes a bead mat, container for beading supplies, a magnetic board, as well as a beaded scissors case for the heart shaped scissors and a beaded needle case. The scissors and needle case will be beaded in class, then the purse will be assembled. 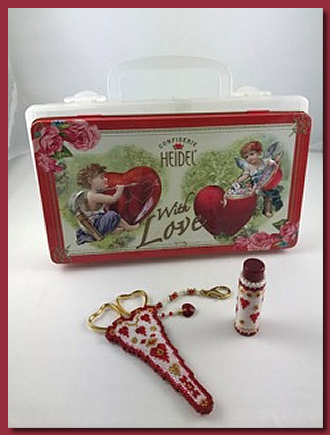 Length 9", Width 5", Height 4"
Kit Contents: all tins, containers, magnet boards, beading necessities, heart shaped scissors, Delica beads, Swarovski’s, embellishments, needles and threads necessary to complete the project. 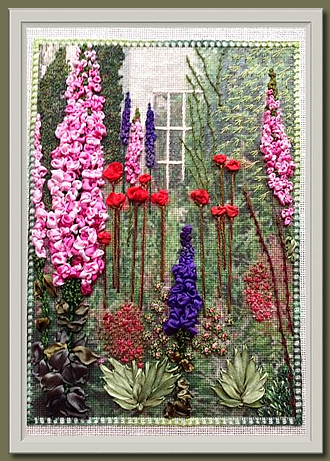 Join me in stitching this delightful silk ribbon garden, an embroidery Study in Perspective and the Knotted Stitch. 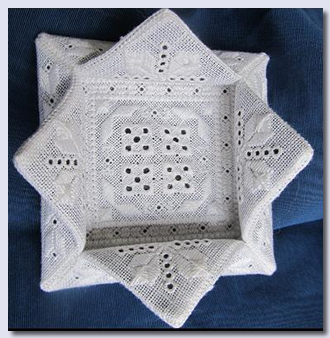 There are 10 stitch variations of knots used in the design as well as the ribbon stitch and the straight stitch. Overdyed silk ribbons in both 4mm and 7mm widths, Caron Wildflowers and Waterlilies, Needlepoint Silks and Pearl Cottons are used to embellish the garden scene on Congress Cloth with a photo transfer. Kit Contents: Teacher provides complete thread kit with needles, photo-transferred, taped Congress Cloth, instruction booklet including a large picture of the design, stitch guides, detail photos, diagrams, and tips on handling silk ribbon. Autumn flashes its warm smiles of color in the Pumpkin Patch. 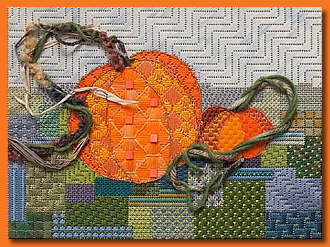 A sampler of stitches creates the verdant earth on which the pumpkins sit in anticipation of harvest. 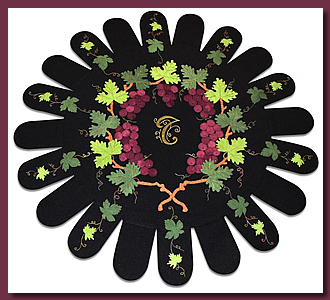 Techniques include adapting and adjusting stitches to reflect the design shape, compensation of stitches, use of color in creating a sense of depth and form, and creating dimensional or dimensional-effect on vines with stitching and working over stitched area. Dresden Lace was an 18th century style of embroidery developed to mimic lace which only wealthiest individuals could afford. It combines counted thread and pulled thread stitches. 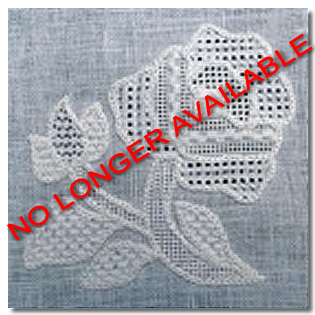 In Dresden Rose, various shades of white and interesting textures are created by a selection of different pulled thread stitches. Compensation in counted thread is covered. The towel is finished with hemstitching so students will learn to draw threads and create a beautiful hem. Some of the flowers will be done in embroidery/canvas work stitches such as bullions, cast on bullions, raised needle lace, spiders, needle weaving, and the cloth stitch. Other flowers, such as the lovely hibiscus is rendered in stem stitch filling. The pansy is stitched on a separate fabric and appliquéd to the main canvas. The antennae of the butterfly will be couched in metal bullion. 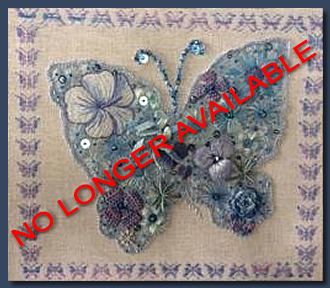 The wavy edge of the butterfly is done with the button hole stitch. Kit Contents: Soie d’Alger, Gloriana silk, Kreinik Braids, Waterlilies, Silk Lame Braid, Accentuate, Highlights, Congress Cloth, Needles, Silver Bullion, Photocopy and Instruction Booklet. Student Provides: 10” x 11” stretcher bars, laying tool of student’s choice, frame weight or table clamp so both hands are free for working, extra #26 & #24 needles, magnets for holding needles, pencil for taking notes, air soluble purple pen, masking tape. 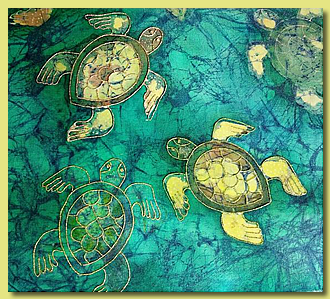 Batik can create complex, stitchable designs with color layering on fabric. Wax is applied to fabric with a stamp called a tjap (pronounced “chop”). Several choices of images are offered – a turtle (color picture), irises, a dragonfly, or a butterfly. Colors are painted in layers alternating with more wax. An optional crackling technique can create a marbled effect seen as navy-blue lines in the turtle design. Safety measures are emphasized throughout the class. Each student receives guidance for developing design elements and using subtle color concepts. Student Provides: Wear old clothing. Potholders. Note: Will be using irons and working with hot wax. 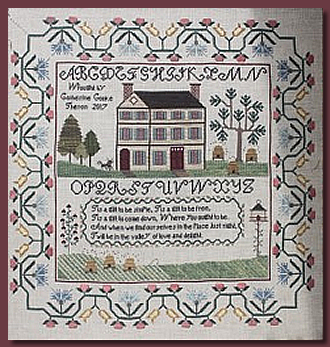 Stitched on 32-count linen, this sampler features a floral & berry border, a quaint farm house, trees, & other rural delights along with the Shaker lyrics “Tis a Gift to be simple...”. Stitches used include Chain, Double Backstitch, Diagonal Double Backstitch, Satin Cushion, Smyrna Cross, Satin variations, Queen, Cross-Over One, Montenegrin, Long- Arm Cross, Diagonal Cross, and Detached Buttonhole. Kit Contents: 32-count linen, silks & cottons threads in various shades of blues, pinks, greens, yellows, grays, reds, & browns. Quilters and artists have long been influenced by the Bible, but none more than the appliqué artists of the 19th century. The wreath of grapes is one such Classic Baltimore album block. Students will learn to make freezer paper patterns, create placement guides and work with embroidery guides. Basting techniques will be presented for increased accuracy and students will be encouraged to embellish the rug using beads, metallic cord and wool threads in their own style to truly make the rug their own expression. Each student will design her own illuminated letter. Tools that make working in felted wool easy and fun will be made available. Kit Contents: Patterns & placement guide, freezer paper, black felted wool, Weeks Dye Works felted wool, Painter’s threads, Gumnut Poppies, Delica seed beads, Perle Cotton #8, Kreinik Braid #8 gold, needles, instructions and color photography.